Bringing communities together through bread is a core aim of Planet Leicester Bakers. The business works to harness the power of bread to break down barriers and improve wellbeing. Thereby putting into practice the business mantra of ‘Good bread doing good’. We use good bread and the positive feelings it evokes in creative and innovative ways. Using bread, Planet Leicester Bakers creates safe spaces for people to spend time together, often tackling difficult challenges they face in their lives, as well as building resilience and well being. All this work naturally bridges the gap between lower cost mass produced bread and higher cost ‘artisan’ bread. How? By increasing local people’s bread knowledge, understanding, skills and appreciation of a popular foodstuff so often taken for granted. Baking a Difference is an innovative care home project created and delivered in partnership with local charity Learning for the Fourth Age (L4A). 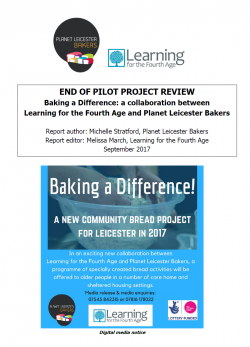 In 2017 Planet Leicester Bakers approached L4A to explore how to bring the beauty and benefits of bread making into elders’ residential settings. As a result, a core four session programme of suitable activities was designed and trialed. We deconstructed the bread making process into ‘bite size’ portions. Additionally, a strong emphasis on the therapeutic benefits of bread making tasks and the conversation that flows around bread is a major feature of the project. Then, in 2018, L4A secured a further £50,000 from the National Lottery’s People’s Project to deliver extended activity. This larger project includes community involvement. This aspect of the project is about bringing communities together and creating a legacy in the form of project training. The aim is to ensure Baking a Difference activity continues beyond the funding period. A care home resident enjoying the bread freshly baked during the Baking a Difference activities. Planet Leicester Bakers has partnered with the charity Gorse Covert Community Centre to offer low price toasting sourdough loaves to raise funds through their coffee bar. Other community groups and charities can, for just £1.10 per loaf, use the toasting bread for one-off events for bringing communities together over toast and tea. The sourdough toast can kick-start conversations about slower bread and food. The loaves are suitable for slicing and freezing, to be toasted one slice at a time. So get in touch to find out more and order your sourdough toasting loaves! Information sheets are provided with the bread and feedback is requested. In 2018 Planet Leicester Bakers teamed up with the Leicestershire Partnership NHS Trust. Together we trained 13 NHS volunteers in basic bread making and conversation skills. 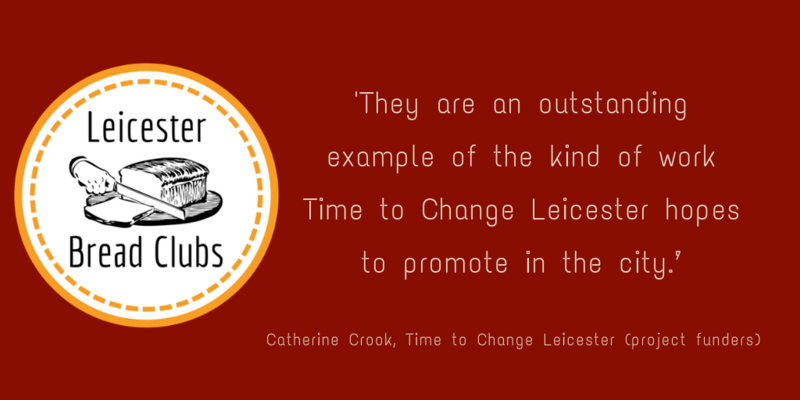 Leicester City Council’s ‘Time to Change’ mental health fund provided the funds. This project used bread making to create safe and at ease spaces for people to spend time together and have conversations in. As with other projects it was about bringing communities together through good bread. Following the end of the project funding, the local NHS invested further in the initiative, showing the value of the role simple bread making can play in mental health and wellbeing. As a result, volunteers continue to deliver sessions with groups and ‘service users’ in NHS and community settings. Jodie, resident at The Crisis House and Leicester Bread Clubs baker. ‘Sharing Bread’ was Planet Leicester Bakers’ first community project. It was the first opportunity to bring communities together around good bread. The project happened across Leicestershire in 2015-2016. ‘Sharing Bread’ taught people how to make a simple loaf of bread. 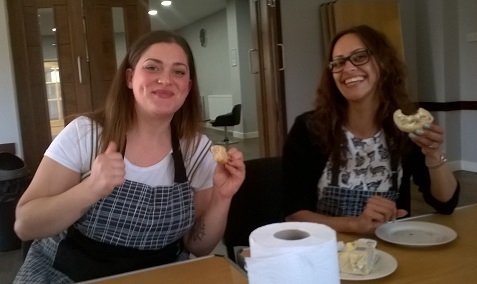 From carers in Blaby District to estate residents in Agar Nook, Coalville, the project delivered bread training sessions to over 60 local people in community kitchens. The project brought people from different communities of common interest together. ‘Sharing Bread’ encouraged them to share these skills and knowledge with one other person in their social and family networks. Planet Leicester Bakers also baked bread live on BBC Radio Leicester; consequently, ‘Sharing Bread’ helped to raise further the profile of good bread locally. Sharing Bread was funded by Leicestershire County Council via its ‘Eating Healthy for Less’, Your SHIRE Community Grant. Sharing Bread participant, Agar Nook estate, Coalville. Future community initiatives are in planning and development, seeking more innovative ways for bringing communities together around good bread. Meanwhile, check out the news section for smaller community initiatives. If you are interested in exploring ideas and partnership working with Planet Leicester Bakers get in touch!